Usually we would be in a dearth right now waiting for the blackberries to start, but mother nature seems to have other things in mind this year and the flowers just keep on coming. Our sun to rain ratio is really working out well for allowing the plants to make nectar. Too much sun and the nectar dries up, too much rain and it gets washed away - Goldie Locks would say this weather has been "just right". 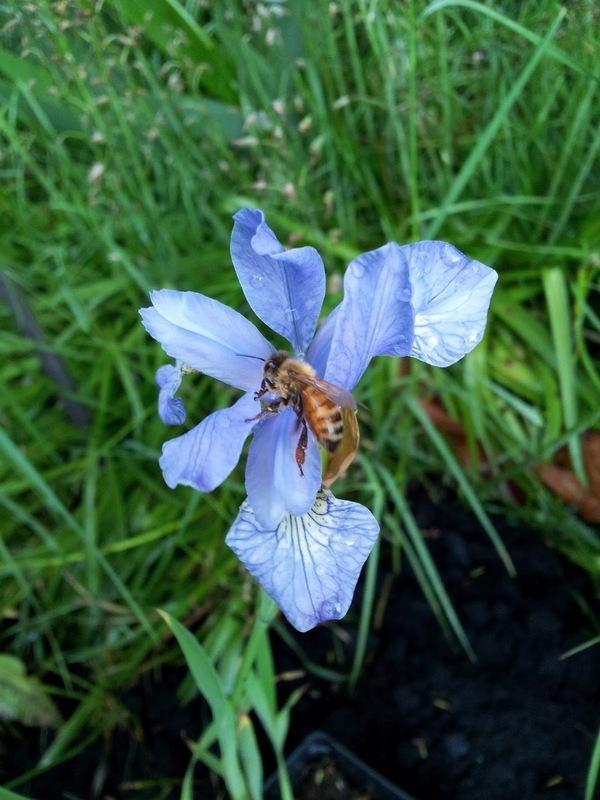 This means that the bees have been able to collect a surplus in resources and they have been storing and drying nectar into honey. Bees by nature are hoarders and will store as much as possible for winter. Here's hoping that blackberries and the rest of summer keep up the trend and we get a good harvest this year. Poppies have been blooming for a few weeks now and the pollen is prized by the bees for the high protein content. 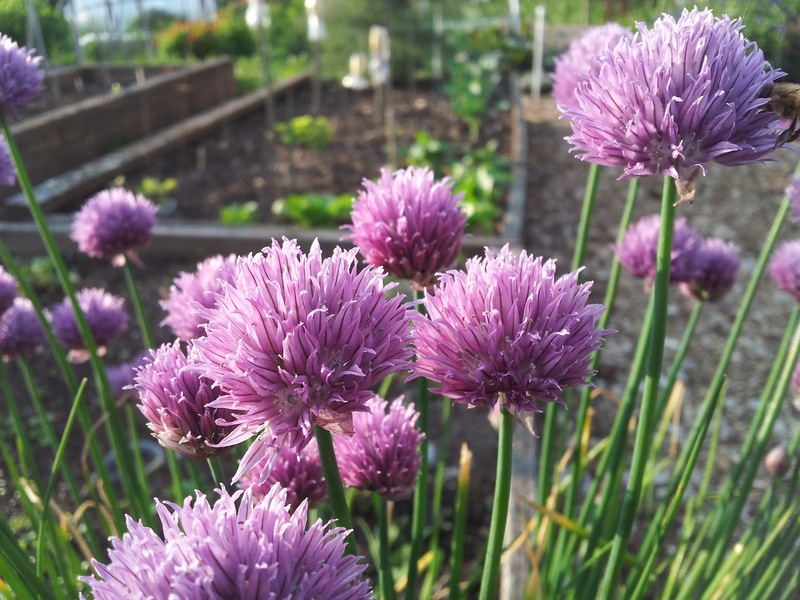 Also many herbs are starting to bloom as well giving the bees a medicine cabinet of variety in food sources to work with. A well balanced diet is just as important for the bees as it is for us. This is why the giant mono crops are so stressful on them, and that stress increases their vulnerability to disease. This girl seems to have gotten herself covered in black pollen. Ice blue Iris seem to be a hit with this one. Chives at the pea patch. Another change going on in the hives right now is that the drones are mature and flying. They head out in the late morning and come back in the early afternoon. Drones are much larger than the worker bees and with that size comes a bit more "buzz" sound from them. When the drones are coming back home you can hear the buzz from the hives about 25 feet away. Here's a short video of the entrance activity when the drones are coming home. Lots of stored nectar/pollen. Not a lot of brood on the way, but tons of bees in the hive. Found another frame with freshly laid eggs in swarm cells. There was one newly created comb of honey in the back that collapsed and two other combs that were crossed together that had to be corrected. I'm finding with this hive that when I add new bars between existing bars that they build bridges on the ends to cross between the combs while the comb is being built out in the middle. It is only an issue if there is a surplus of nectar/pollen coming in that they make these bridges large enough to attached to the new bars. They should talk to the Engineers about building stronger combs before overfilling them with honey. Lots of brood and they are storing nectar/pollen and building comb. So far everything looks good here. They have been storing nectar/pollen. Not building comb, but have a good number of bees throughout the hive but not much brood. No signs of supersedure or swarming. Took a quick look and one of the queen cells was opened but the others were still closed. No checks, however Nuc 4 got a frame with eggs and cells from the Geeks. Tucked away in a sunny spot. This hive is in good shape and they are building comb. There is a little stored nectar/pollen but mostly it's just frames of solid brood. Doing what she does best, laying eggs everywhere! Saw the new queen and she hasn't quite kicked into egg laying yet, but her abdomen is swelling up. As a result of the brood break this hive is almost all honey/pollen. They are building new comb which is the only place the queen could lay in if she was ready. Swapped a frame of nectar/pollen with a frame of fresh eggs from Sand. She still has a bit of fuzz left and her mothers looks. Next week I should have some updates on the Nucs and will talk about mating flights. Hopefully we will have a patch of good mating weather this week. 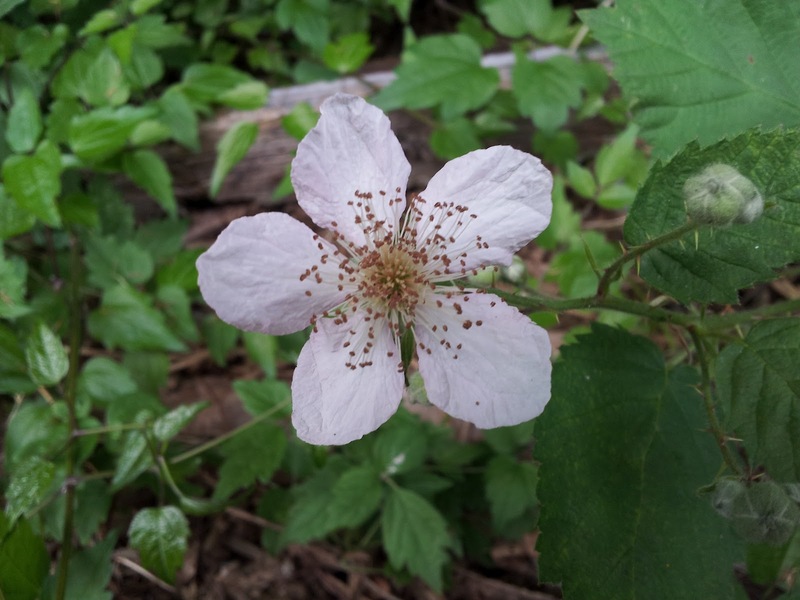 Blackberry flower down the street - A preview of things to come!